The hypothalamus, located in the brain, responds to low thyroid hormone levels by releasing TRH (thyrotropin releasing hormone). TRH tells the anterior pituitary gland, which is also located in the brain, to release TSH (thyroid stimulating hormone). TSH then stimulates thyroid hormone production in the thyroid gland and T4 (thyroxine) is released. T4 is converted to T3 (triiodothyronine) in the kidneys, liver and spleen. T3 is much more active and powerful then T4. There are many ways in which the thyroid gland or thyroid hormones can be functioning improperly or inadequately. The problem may come from the hypothalamus or pituitary’s inability to communicate properly with each other and/or the thyroid gland. The thyroid may not be able to make enough T4 hormones or it is not being converted into the active form of T3 in the body. There is also the problem of antibodies that can attack the thyroid gland. 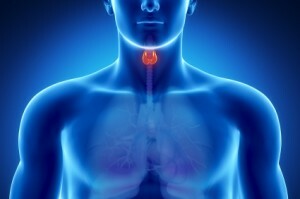 The autoimmune component of thyroid diseases is becoming much more recognized and understood. Hypothyroidism is when the thyroid hormones (T4 and T3) are too low. The symptoms of this are usually fatigue, weight gain or the inability to lose weight, dry skin, hair loss, muscle aches, excessive sleeping, cold intolerance and occasionally depression or depressive moods. Women’s menstrual cycles can also be adversely affected. When there is an autoimmune component to hypothyroidism, it’s called Hashimotos. This is when antibodies attack the thyroid gland,often resulting in an enlarged or nodular thyroid that eventually may be destroyed. Hypothyroidism is very common and should always be investigated for Hashimotos. Treating the autoimmune reaction is very important, not just to protect the thyroid gland but also to prevent other autoimmune conditions from developing. Hyperthyroidism is when the T4 and T3 levels are too high causing insomnia, weight loss, anxiousness or panic, heart palpitations, muscles weakness, sweating and heat intolerance. It is usually due to Graves disease which is a different autoimmune process where the thyroid gland is over stimulated leading to excess production of thyroid hormones. If left untreated, the thyroid gland may also be destroyed but more serious are the systemic effects, specifically damage to the muscles supporting and surrounding the eyes which is irreversible. Those are the most common forms of thyroid disorders that can be easily and effectively managed with a myriad of treatments. At Flow Natural Health Care we can test, diagnose and treat thyroid conditions while treating the underlying cause and risk factors. We believe the autoimmune process needs to be addressed and well managed to prevent complications from developing. We also recognize the interconnectedness of the thyroid to the adrenals and ovaries or testis. Supporting that triad is integral to optimal health and properly managing any and all thyroid conditions. Whether you are suffering from an overactive thyroid, or if you have thyroiditis, at Flow Natural Health Care we are experts when it comes to diagnosing and treating any problems associated with the thyroid gland. Contact us to see how we can help.